A few days ago we went to the beach with my sister (Steph) and her family. As you may have notice (maybe not) Steph usually opts out of any taste testing but this time she said she’d partake. Her husband Rick is a fan of junkfood and always up for an evaluation, we also got their 3 1/2 year old son Kyle to help too. These have a grainy texture which at least gives you the illusion you’re eating something mildly healthy. I felt like there was a slight chemical taste to them. Rick and Ethan said they were a little dry but really liked the fruit filling. Steph changed her mind didn’t try these saying she knew she liked the other brand better. We asked Kyle if he liked these and he just nodded his head. 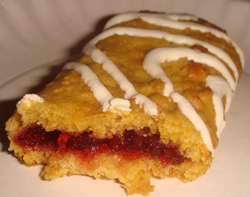 Fruit & Grain was slightly different because of the swirled icing on top. I didn’t really notice much taste from that but Steph said that’s why she likes these bars better. She also said she likes how moist they are. We all agreed they were more moist but to me the extreme softness seemed “un-natural” like it was a doughnut or something. There was also a checmical taste to these like with the Nutri-Grain. When asked, Kyle said he didn’t like it but ate the whole bar. Ethan and I liked the Nutri-Grain bar better for it’s texture and tastier fruit filling. 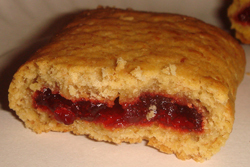 Rick liked the texture of the Fruit & Grain bar better but preferred the fruit filling of Nutri-Grain. Stephs stand by Fruit & Grain even without trying the other one and Kyle kept changing his mind I think just because he liked being asked questions, but he did eat both bars. 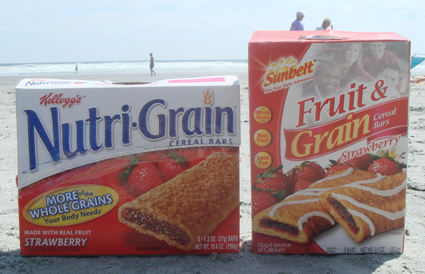 Nutri-Grain or Fruit & Grain? You run a taste test website, and you allow a family member to half-participate in a comparison tasting? I think your sister is a pain, and you should not have allowed her to participate at all. weak. AC, Sorry you’re so upset but it’s not like I’m Consumer Reports. Thanks for taking this so seriously but my blog is really just for fun. I hope somehow you may be able to choose between these bars without Steph’s full opinion. I find your methodology so UNSCIENTIFIC that I have decided to express my OUTRAGE by typing random WORDS in CAPS. Hahahahaha…Also, my daughter loves the strawberry Nutra-Grain bars and was delighted to find them at Big Lots! over the weekend. I think half a box is gone already. Ooo. That fake Nutri-Grain bar (Sunbelt) looks kinda good. I’ll track one down. I love the Sunbelt snacks. They make a great breakfast.